ACD Queue - (ACD Automatic Call Distribution)- A system where callers are placed in a holding area until the proper person is available to take the call. ACD can handle the calls based on a predetermined priority, next available, skills based routing or first in first out, etc. Auto-Attendant- (IVR Interactive Voice Response) An auto-attendant is usually what greets your callers and allows them options, depending on who or what department they need to speak with. With prompts such as "Press 1 for sales, 2 for support and 3 for shipping" it can save resources by directing incoming calls appropriately. Powerful and intuitive Zerabox's IVR can be configured with a few clicks on your mouse and can be managed to build call flows that enable both on site and off site transfers. Blast Groups- A group of phones that will all ring simultaneously when a particular number is called. The first phone that picks up the call, gets the call. (Also known as Ring All or Simultaneous Ring). Branch Office- Adding one, two or more extensions for a branch office connected with an Internet connection (VoIP) allows users to become part of the main offices dialing plans when simply plugging in an IP-phone. Call Forwarding- Users can access a Web Control Panel to enable forwarding to other extensions, ring all groups or an external number, such a cell phone. Call Parking Area- Users get the ability to view which calls are currently parked and drag calls between their extension, their on-hold area, and the parking area. Call Reports- Report of inbound and outbound calls with duration of call, DID, caller ID (when available), and date and time stamp. This report is searchable and can be downloaded to a csv file. Conference Bridge- Allowing callers to access a session or meeting, Zerabox® connects those callers and uses built in features that announce who is entering and who is leaving and monitor those in conference. Once bridged together callers can hear and speak to all others or be muted for listening only. Custom caller IDs- Easily change the Caller ID name/extension display for a department or an extension. Extension Groups- Through "groups" you get the control to organize extensions and apply similar permissions to these groups. This hierarchal system gives you complete control over your groups with the ability to set permissions for a multitude of features. Intercom- Connect to your premise system for paging and announcements. Find Me-Follow Me- Pre-configuring a call to automatically forward if not answered at a particular phone to another phone and even a third phone, such as a cell phone. Music on Hold- While on hold callers will hear music, either some of the already preconfigured music choices that come as part of the system or if you have a preference for a recording of your own, upload an MP3 of it and you can have it play. Name Directory- Delivered including a pre-configured "spell by name" directory, Zerabox allows callers to use this feature to call particular employees by keying the first three letters of the parties first or last names. You get the control of removing names form the directory for those employees that wish to remain more anonymous. Operator Panel (with BLF)- A web based full featured operator panel including indicators that display when an individual is on the phone or available. Outlook Integration- Use your Outlook contacts to call them by just clicking on their name. Paging- Page by groups or individuals, it's your choice. Scheduler- Zerabox allows you to use times, days or events to set different options, like a different message or an entirely different attendant menu. You get the flexibility for your business needs. Setting or creating a schedule is easy with our intuitive web based control panel. Skills Based Routing- Using the ACD, routing callers to the appropriate person first (one who would be best to handle a particular type of call) and then if unavailable to the next inline. SMS Pager Notification- By entering an SMS or Pager email address notifications can be automatically sent out and received at those devices. These are short instant pages that notify the recipient of a message which they can then retrieve through either calling their voicemail or using our web-based control panel. Voicemail- Stored on the server, your messages are available from your phone another phone or from a PC through web based access. A copy of your Voicemail is also sent instantly via email in a WAV file which can be listened to on your PC. Multiple mailboxes make it easy to store your messages for later retrieval. Voicemail to Email- Immediately upon receiving a voicemail you will be sent via email a copy of the message in a .WAV format which can be played right on your PC. Voicemail Groups- If you need to send a message to multiple recipients then it becomes easy by creating a Voicemail group. Build a group and name it and assign it a number, dial that number and leave a message and everyone in that group will get it. Web Based Control Panel- Zerabox® allows for complete control in its intuitive easy to access web portal. Make changes, set up extensions and turn on or off features with the click of a mouse. Evolutionary design advances make this control panel one of the best anywhere, a world of difference from traditional cumbersome PBX administration panels. As you read through these feature descriptions, you get the choice of which features you want to use and how you want to use them. Zeracom's professionals are there for support and installation configurations based on your specifications. 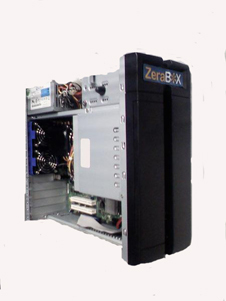 The Zerabox® feature set will take you where you need to be long into the future. Backed by Zeracom, a telephony/data company with over 15 years experience. Zeracom's support and customer service. Control-you decide to turn on or off a feature. Zeracom has installed thousands of PBXs and our experience shows it. We believe that a customer's installation should be done right the first time. And it doesn't end there. Zeracom trains you on the features and how to set those features. We stay as your Zerabox® partner; offering support, maintaining a robust business phone system that will take you well into the future. Asterisk® has become the PBX software of choice. Like Apache, an open source web hosting application which most web servers run and keep our Internet as we know it today, they both sit on a Linux operating system. Having been written and revised for its nine year history Asterisk® has proven itself to be the de-facto PBX software of choice. It's been supported and embraced by the open source community, with ever more features being developed and distributed through a non-licensing open community. With millions of installations worldwide, the stability of this PBX operating software has continually been tested and come through been than ever. And through shared resources has a support community that allows for more documentation, than any closed proprietary system, laying a foundation that continue well into the next nine years. A lower price is one of the big benefits of Zerabox®. You'll get a lower price without having to sacrifice quality, features or any of the other low cost traps.